I had a dentist tell me something which I’m not sure about. It’s one of those gut feelings that something is wrong. I asked my dentist about dental implants and he said he won’t give me any until I get my gum disease completely dealt with. I was a tad annoyed and thought it wasn’t fair of him to withhold teeth until I did another demanding group of treatments with him. I decided to get a second opinion. This dentist said the reason my dentist won’t give me implants has to do with US regulations. But, if we went over-the-border to Mexico, he could not only give me dental implants but could do them for less than half the price. It’s one of those things which sounds too good to be true, so I thought I’d ask someone about it who is too far away for me to use their services. I’m very glad you followed your gut and wrote. There is something seriously hinky going on here. No legitimate dentist would take you over the border in order to place your dental implants. He’s also lying about the reason the first dentist said no. Your family dentist wasn’t trying to force you into treatment for gum disease. He was trying to protect you from spending all that money on a procedure which was absolutely bound to fail. If you think about it, gum disease leads to tooth loss, because it costs you bone support. 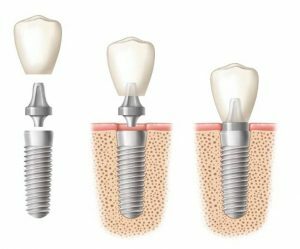 If you don’t have enough support for natural teeth, you will also be unable to retain the implants. Any legitimate dentist would have told you treating your gum disease is your priority number one. Then, once you have that dealt with, you’ll likely be able to safely get implants. This situation reminds me a little of the Mansueto Scandal. This former dentist, who’d lost his license took a patient to Tijuana to do her implants and practically butchered her. She’s suffered greatly as a result. I’m grateful this didn’t have to happen to you. There are temporary solutions for you to get teeth while you get your oral health in order. Removable partial dentures will be one option. There are others. Just speak to your dentist about it. By all means, I suggest you tell your local dental board about the hinky dentist. It’s very likely he’s practicing without a license. I need some advice. I’ve been with the same dentist for years. He’s always been a great family dentist. However, recently, my daughter has been suffering from bulimia. We’re aware of the situation and working with her, but the dentist noticed the damage and was a bit rude. He said, “You think purging will make you pretty, but how pretty will you be when all your teeth are destroyed?” While I know he’s trying to help, it didn’t and made my daughter feel even worse about herself. Plus, now I’m worried I won’t be able to get her to go back and she’ll need dental care now more than ever. What do I do? The best dentists put their patient’s at ease. First, I would tell your dentist exactly what you just told me. He needs to know this isn’t what will actually help a bulimic patient. It sounds like he cares, but is sort of a bull in a china shop when it comes to sensitive emotional issues. I’m also going to say this won’t be the best dentist for your daughter during her recovery. She’s going to need a dentist experienced with this type of dental situation. In fact, if there’s already visible damage, she’ll need an artistic cosmetic dentist. The damaged teeth will likely need porcelain crowns, depending on the severity of the damage, especially if she’s still purging. It will cover the back of her teeth which receives the brunt of the acid. Because it is often the front teeth which take a large amount of the impact, the skill of the cosmetic dentist is important. You want your daughter to feel good about herself. A beautiful smile can help do that. In your place, I’d go to the mynewsmile.com website. They recommend the top of the line cosmetic dentists in every area. You input your zip code along with the distance you’re willing to travel. They’ll then list expert cosmetic dentists in that radius. Do a quick check of their reviews to make sure patient experience and satisfaction are good. Then, call the office and talk to them about the situation. Most cosmetic dentists are familiar with bulimia and have dealt with it before, but it never hurts to check. Best of luck to both you and your daughter.